It has the original front bumper of lighter steel with curved ends. The heavy channel section she now sports was added in Manchester. The brackets for the fog lamps are still there, although the lamps are missing. Note the wheel trims. You can see behind the passenger straight through the side door window. This means the rack bays were not yet fitted inside, so this picture was probably taken before any of the electronics were installed. 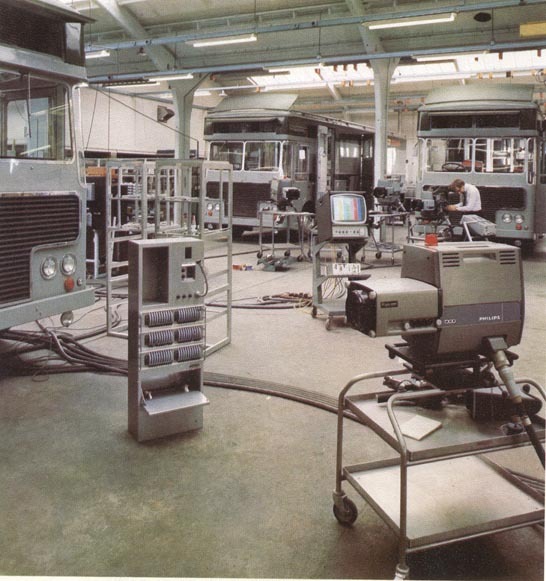 These photographs were used by Pye for publicity purposes, and show the three Pye PC80 equipped scanners being built at the Coldhams Lane factory, at Cherry Hinton, Cambridge. They had not yet been registered, and were presumably driven on trade plates, so unfortunately we cannot tell which was CMCR9. However, one of them must be- there were only three built. 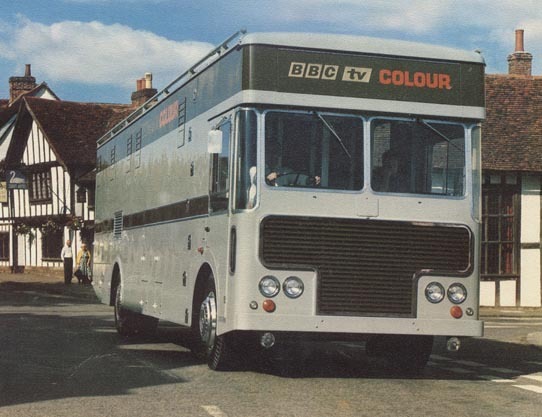 This picture shows a Type 2 outside The Swan at Lavenham in Suffolk, which still looks exactly the same today. The Vision area. 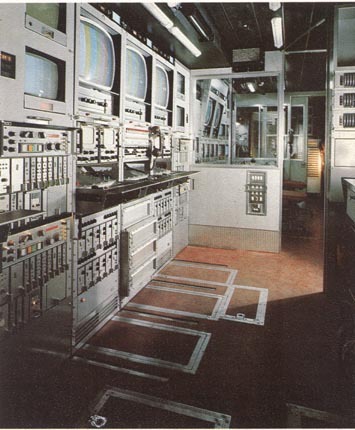 Note the original Pye /RBM hybrid colour monitors, showing colour bars. They were replaced in the 70s due to extreme unreliability. I don't think I have ever seen one. They look much better than the Prowests which are less tall so don't quite fill the holes. The Production gallery looking tthrough into Sound. Super picture of the prod. gallery and racks. The mixer panel is all lit up and all the monitors fired up. There are no actual pictures so maybe the cameras were not set up yet. In the background are the extra racks for cameras 5 and 6. Everything else is pretty much as it is today, only cleaner. The Pye monitors had hinged flaps over the controls with plastic ident labels which were illuminated by the monitor 'on' indicators, these became red tinged when the cue lamp was on. Presumably these flaps became annoying as the controls needed regular tweaking, as they have now gone. We have found a couple but it is not worth trying to refit them. Also it can be seen that the vision mixer panel has now got more knobs. 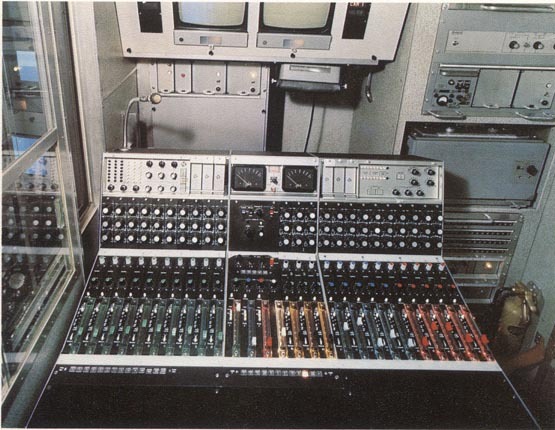 The mixers were modified for CSO in the 1970s and gained extra controls. The Sound control room. The desk is different- the compressors are not fitted. See the Studer A62- no lid. The lid on C9 does not fit, the clamps are in the wrong place. 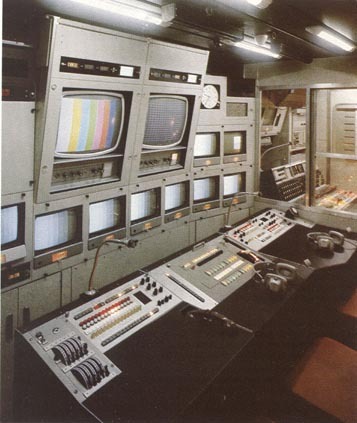 There is a unit under the picture monitors, no longer there, but there is now a channel control for the Storno comms. transceiver. The interior of the Royston factory. One of these is CMCR9! We think it may well be the one to the right of frame. The reason is that it obviously has no internal fittings yet, while the others do, and we know that C9 was the last of the three Pye units to be completed. Perhaps this means that the one in the outside shot might also be C9, as it has no racks behind the cab. The PC80 can be seen on a test rig in the foreground. The lighting control panel is on the floor. These were not used in practice, and were later removed. The frames behind are the sliding racks for the vision control positions. Here is a bit of real anorak stuff. The PC80 in the foreground is a PC80, not an LDK3, as it has a G101 cable. But it says 'Philips' on the side. I have copies of a memo from Pye instructing engineers commissioning the cameras to remove the Philips badges and fit Pye ones, so this was presumably before that was done. All in the name of 'Buy British', then an important BBC directive. Sadly, you won't find much electronics of British manufacture in a modern TV studio. The young gentleman in the background burrowing into a PC80 very kindly sent me these pictures, he was involved with the original acceptance tests for the BBC. 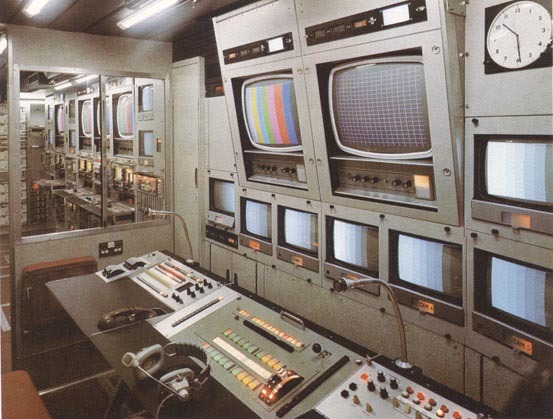 What a fascinating set of pictures, detailing the 'state of the art' of colour television over 40 years ago, and of course of great importance in the story of CMCR9.